[haqnmaq] admits that he suffers from Obsessive Compulsive Disorder and on occasion, can be found washing his hands up to 20 times an hour. Very distrustful of cloth towels, he exclusively uses paper towels to dry his hands, to the tune of 2-3 rolls a day. 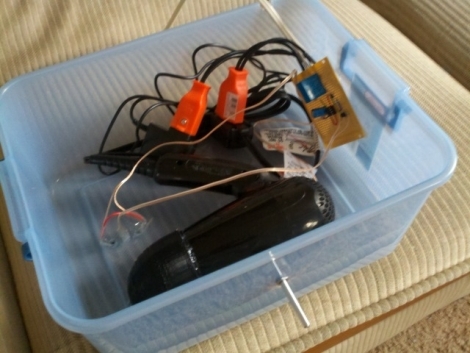 In an effort to lessen the impact his OCD has on the environment and his wallet, he decided to build an automated hot air hand dryer using a 555 timer, which doubles as his entry in the 555 Design Contest. The concept behind his project is to use a hair dryer as a hot air source, relying on a phototransistor and a pair of IR LEDs to detect when hands are placed under the dryer. When a pair of hands are detected, a relay is triggered and the hair dryer is turned on. Once the dryer has run for a pre-determined but adjustable time, the relay is opened, and the hair dryer turns off. It’s a pretty simple project, but one that is quite useful, whether you suffer from OCD or not. The only thing he might want to watch out for is the restricted air flow to the dryer, since it is mounted in a sealed plastic container – a few seconds with a hole saw should remedy the problem quite easily. Want to see the hand dryer in action? Keep reading for a short video demonstration. Instructables user [djsfantasi] wanted to build an animated holiday display using puppets as a means of raising money for a local arts program. After doing a bit of reading and research however, he decided that building animatronic characters for the display was not that far fetched an idea. His first inclination was to build a penguin, allowing him to focus mostly on torso motion rather than having to articulate arms and legs as well. His goal was to enable his penguin to “dance” by shimmying and shaking as well as flapping his wings. 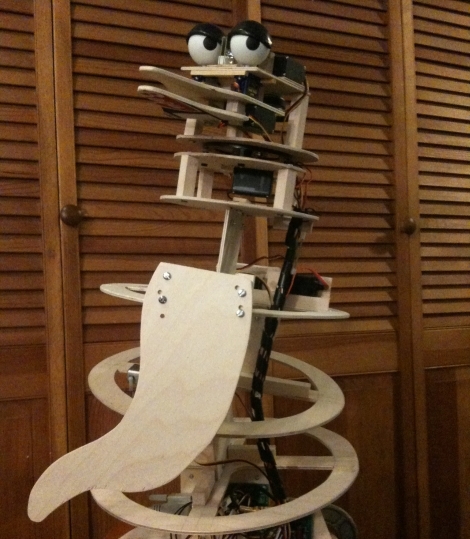 Using plywood, four servos, along with some miscellaneous connecting rods and cables, he went to work. The penguin is operated using a SSC-32 servo controller that features an ATmega168 MCU at its core. This allows him to control all of the servos independently, and also in concert, allowing for combined movements. The penguin’s mouth also functions, using a circuit that synchronizes its movements to an audio file. 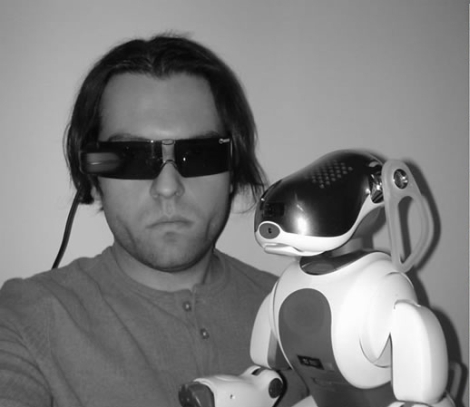 While the robot is currently tethered to his computer via a serial cable, [djsfantasi] mentions that he is currently working on an iPhone app that will be able to control the robot wirelessly. All he needs to do now is build an animatronic Tom Servo then toss a Crow skin over this one, and he’ll be all set! Keep reading to get a look at the penguin moving and grooving in the video below. [Apexys] is performing some experiments with switched-mode power supplies and needed to compare the inductance of the coils he was using. His multimeter doesn’t have an inductance testing function, but he does have a 555 timer on hand. He put the 555 and some other parts together to create his own L meter. 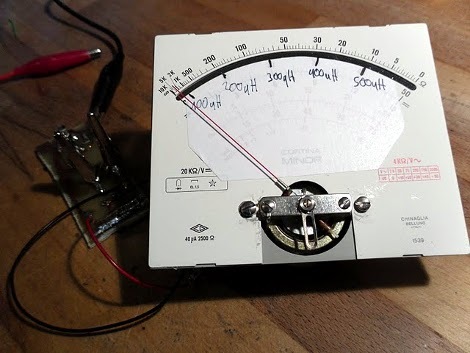 The writeup includes the theory behind this meter, with an incoming AC source converted to a voltage by an RC network. Once he’d worked out the design it was time to build the circuit. Instead of printing a circuit board he created what he calls a DCB; Drawn Circuit Board. We’ve got to admit that this was way faster than using toner transfer or soldering point-to-point. We also like his use of an Erlenmeyer flask and a torch to heat the etchant. We don’t make PCBs in the winter because our Cupric Chloride is too cold to use outside but that may change now. The final piece in the puzzle is an analog meter which he pulled from an extra microamp meter he had on hand. Check out the demo after the break. Clocks are relatively simple devices – they tell time, and most often sport a handful of other utilitarian features like alarms and radios. Rarely though, do you see a clock that will wake you up in the morning and also curse at you shortly thereafter. [Matt Evans] clearly thought that clocks need to pack a little more attitude, so he built his girlfriend a clock that not only tells time, but spouts off nasty phrases as well. What a lucky gal! 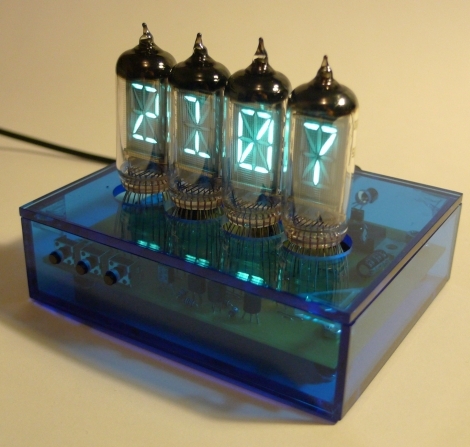 The clock was constructed using IV-17 VFD tubes, each bearing 16 light-able segments. It seemed wasteful to simply use the tubes to tell time, so [Matt] got busy adding other features to the clock. It has an alarm, a calendar that is always stuck on his girlfriend’s birthday, and an ambient light sensor to dim the tubes at night. It also sports a variable rudeness setting, allowing for mild insults when family members are present, and extremely foul language for when your frat brothers swing by. He has plenty of pictures on his site, but we’re betting people will want to see schematics and some source code. After all, Mother’s Day is but a few months away! 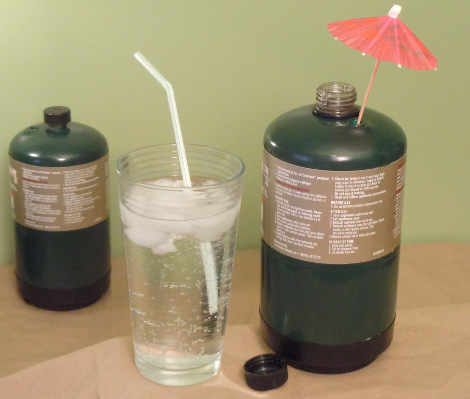 [hpstoutharrow’s] new instructable is a neat idea on how to re-use those single use small propane bottles by turning it into an insulated canteen. Once the bottles are emptied through normal use, the safety valve is popped loose and allowed to vent. There are also comments on the article that suggest that the bottle be submerged to ensure all gas is gone, and we think that is wise too. Once safe to work on, the bottom is cut open and the stem is cut off leaving a empty shell, a soda bottle is shrunk down by boiling water inside of it for a little bit, then is fit inside the propane bottle. The top of the soda bottle is held in place by an O-ring, the safety pressure hole plugged up and the whole thing is filled with spray “expand-o-foam” locking everything in place and adding insulation. Though using a thermoplastic bottle as its liner does not invite hot beverages to the party, it seems to do the job just fine for cold drinks, and it makes for a interesting conversation piece out on the campground. Join us after the break for a quick how-to video. [Phillip Torrone] recently wrote an article over at Make regarding Sony and their “War on Makers, Hackers, and Innovators“. In the article, he traces Sony’s history as a well-liked hardware company that once produced innovative products, to its current state as an enemy to all who would dare wield a screwdriver and soldering iron. He took quite a bit of time scouring the Internet to dig up very specific examples of Sony’s perceived assault on the hacking community. That’s not to say he simply lambasts the company and leaves it at that. Rather, he reflects on their past as a staple in nearly every American home, how they have changed since venturing into the content business, as well as what we might be able to do as hackers to change the way Sony treats its customers. One specific example he mentions is the lawsuits that plagued the Sony Aibo modding scene, a case very near and dear to his heart. This scenario is one where the voice of the people was eventually heard, though too late to make a difference. He laments the loss of interest in the platform by the modding community as a clear cut example of the disastrous nature of Sony’s litigious nature. You should definitely take a moment to read the article if you have the time. [Phillip] brings up some very good points, giving you plenty to consider the next time you make an electronics purchase, large or small. We’d love to hear your take on the matter as well.